Putting up Christmas lights on your own house for the first time. There's something a little magical about that. 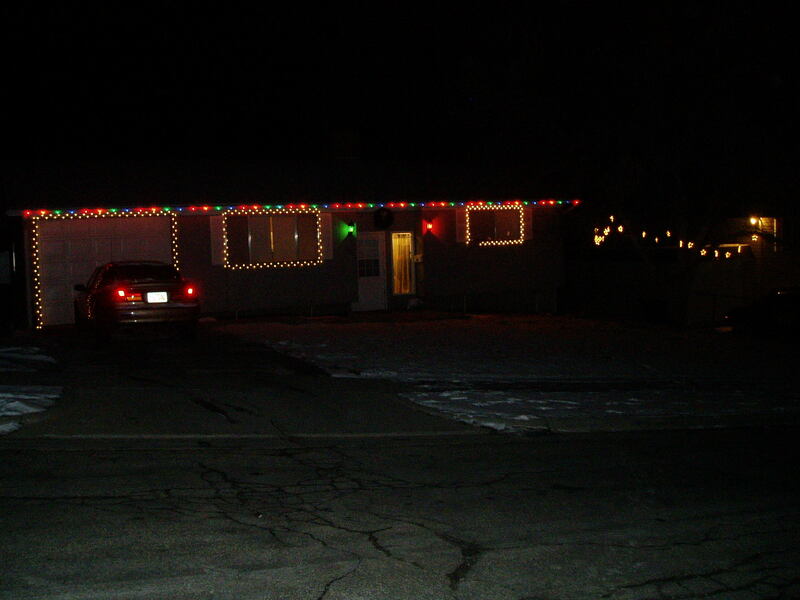 And every time I drive up to my house and see the lights, it reminds me a little bit of how awesome it is to come home to my parents' house during the holidays. My mom goes all out and I'm not exaggerating to say that she's got the best looking Christmas light display I've ever seen. It's perfect in every way. And though mine is a long way from hers, I can feel a little of that same excitement coming home to a house that's all lit up and waiting for me each night. maybe my wife got it out of her system and won’t have to come home and climb up on our 2 story roof scaring me half to death. Well I’m certainly not going to do it! Awesome! I love it! I especially like the red and green lights, nice attention to detail. How did you get your lights perfectly aligned? And then, how do you get them to STAY? Last year, we put lights up in our apartment window, and they kept falling down. Stupid piece of crap sticky-holder-uppers. Awww! Yay! I am ready to be festive now. The lights on the roof are all straight. We got these little plastic holder thingies that clip onto the gutter and then clip onto each light to hold them in place. The lights around the garage and windows are not exactly straight but in this cool alternating pattern that makes a pretty little zig-zag line around whatever you're framing. Since the house is wood, we were able to use a staple gun to keep the lights in place. I have no idea how we'd do it if the house was brick or stucco or something. Its so pretty! And yes, your mom DOES have THE prettiest holiday setups. I love Christmas lights — on other people’s homes. I’m no Grinch, but much to my children’s chagrin, I long ago foreswore putting up exterior Christmas lights on our home. (Um … holiday lights for the PC types.) Actually, the teenagers now appreciate that decision because they realize that they would be helping with the setup and teardown. The inside of our home is now charmingly festive after last Saturday’s decoration event. It’s really the first time all five of the kids have been able to help in a meaningful way. I can already see that there will be very few more Christmas seasons where all five kids will be around to help, so it is something to be cherished. Believe me, I have a new understanding for folks who don’t take their lights down in a timely fashion. It took us the better part of a day to get them all up, and crazy me wants to keep on upping the ante each year with grander displays.